Alan King was born in Meyersdale, PA in 1977. In 1982 he moved to Washington State. He went to school in Newport and participated in baseball, cross-country, and track throughout junior high and high school. After graduating high school in 1995, Alan King went to Whitworth College for one year. He was on the track and cross-country team. In 1996 he enlisted in the Marine Corps. 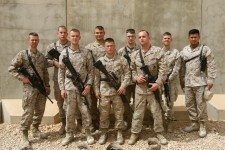 His first tour was with Second Supply Battalion at Camp Lejeune, North Carolina. In October 1997, he ran the Marine Corps Marathon. During his tour with Second Supply Battalion, Corporal King participated in several exercises including BATTLE GRIFFIN ‘99 and MARCOT ‘98. In July 2000, he separated from active duty as a Corporal and joined the Selected Marine Corps Reserve unit 4th Service Support Group Forward (East). He was promoted to a Sergeant in the Reserves in October 2000. As a civilian he worked at Cherry Point as a contractor filling various logistical roles for the Naval Depot. Following 9/11, his reserve unit was activated in July 2002 and they augmented Second Force Service Support Group. They deployed to Kuwait in support of OPERATION IRAQI FREEDOM in 2003. Sergeant King worked in the G-3 at the Marine Logistics Command in the future operations cell. After coming off activation in July 2003, Sergeant King pursued rejoining the Marine Corps as a regular active duty Marine. In March 2004 Sergeant King reenlisted into the Marine Corps by laterally moving to the 0231 Intelligence Specialist field. He attended the basic intelligence course at the Navy Marine Corps Intelligence Training Center (NMITC) in the summer of 2004. Following the basic course, Sergeant King was stationed in Okinawa, Japan at Camp Foster with Marine Wing Headquarters Squadron in the G-2 for one year. During this time, Sergeant King participated in several exercises and helped support the unit’s tsunami relief efforts in Thailand and Indonesia. Sergeant King was then stationed at Marine Forces Central Command (MARCENT) in Tampa, Florida for three years. He was promoted to Staff Sergeant in May 2007 and attended the advanced intelligence course at the NMITC. While stationed at MARCENT, Staff Sergeant King made three deployments to Bahrain to the MARCENT Forward Headquarters. 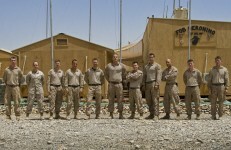 In September 2008, Staff Sergeant King executed permanent change of station orders to Third Battalion, Third Marines to fill the role of the intelligence chief. During this tour Staff Sergeant King made one deployment to Iraq in 2009 and one deployment to Afghanistan in 2010. 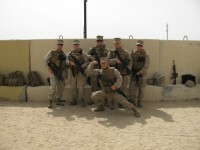 In February of 2011 he was promoted to Gunnery Sergeant. In July 2011 Gunnery Sergeant King executed orders to 1st Intelligence Battalion. He was deployed to Afghanistan in December 2011 for six months working inside the intelligence operations center for Regional Command Southwest. Alan King is married to former Air Force Staff Sergeant Amanda King. She is currently pursuing a masters degree in health administration. They have a daughter, Lilah, and two sons, Ethan and Brennan. Alan King’s awards include the Meritorious Service Medal, the Navy Commendation Medal with a gold star in lieu of second award, the Navy Achievement Medal with two gold stars in lieu of further awards, and the Good Conduct Medal with four stars in lieu of further awards. In 2011 he was awarded the Master Gunnery Sergeant Samuel C. Plott Staff Noncommissioned Officer of the Year award for intelligence work. (L-R) Sergeants Jorge Diaz and Kenney Clark, Corporal Raymond Weeks, Sergeant Justin Johnson, and Staff Sergeant Alan King, Hawaii 2011.